David listened to what the others said and thought for a few moments. He didn't often talk to the other boys about what he was thinking, but this time he opened his mouth an said, "I'm going to be a millionaire and retire by the time I'm forty!" 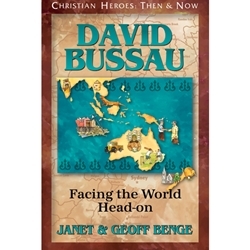 David Bussau grew up in New Zealand boys' homes where expectations of the young men were grim. David shattered those expectations, emerging as an enterprising teenager running a rented hot dog stand. Numerous business ownerships and financial success followed, and with that success, a vision to provide natural disaster relief and aid to the poor in Australia, Indonesia, India, and beyond.